Most nights when I tuck Colt into bed, he asks me for a story. My go-to strategy is to tell him a story of my childhood. Sometimes it’s just a snippet of a memory, but he never minds. He listens and as he asks questions I’m often able to remember more details. Who else was there? What did you do next? What did Mamaw and Papaw say? Did you get in trouble? And the subject matter is often ripped from the calendar. In December, I told all my Christmas stories. The night before first grade, I shared my favorite first day of school memories. Tonight, he asked me for a story. Initially, I drew a blank. I don’t have any St. Patrick’s Day stories, necessarily, but when I think of the color green — one story immediately jumps to mind. So I told him about the time his Uncle Tom and I decided to surprise Mamaw by making cookies while she was running errands one day. We’d seen her make no-bake oatmeal/cocoa drop cookies a dozen times, and we could certainly follow a recipe. I think we were 10 and 12. The recipe called for cocoa, but we substituted instant hot cocoa mix instead. Honest mistake. And when they turned out a dirty, light tan color instead of rich chocolate brown — we were understandably disappointed. I told him about how Uncle Tom and I collectively solved this problem of undesirable color — with green food coloring. Colt giggled and giggled when I told him that Mamaw came home and discovered the ugly green cookies, tasted them to discover they were completely inedible, and promptly threw the DOUBLE batch we’d made into the trash. The solid green rocks of cookie-glue hit the bottom of the trashcan with the sound of a bowling ball hitting the floor. 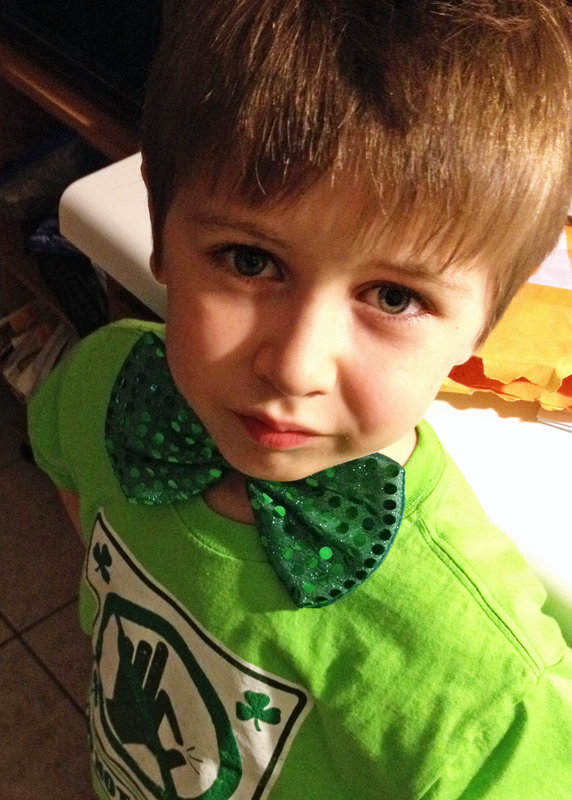 Uncle Tom and I got an important lesson in recipe-following, and Colt got a story about green on St. Patrick’s Day. Sounds like the luck ‘o the Irish to me.